Large crowds have remained on the streets of Sudan’s capital, Khartoum, through the night, ignoring a curfew declared by the military. But demonstrators say the military council which has taken power is part of the same regime. There is also a real danger that different elements of the security forces and militia could turn their guns on each other, says BBC World Service Africa editor Will Ross. The UN and the African Union have both called for calm. Sudan is due to reopen its airspace on Friday, following a 24-hour suspension, but land and maritime borders will remain closed, the military council has said. The curfew, in force from 22:00 local time (20:00 GMT) to 04:00, was declared for the “safety” of citizens, state media said. The armed forces and the security council would carry out their “duty to uphold peace and security and protect citizens’ livelihoods”, it said. What are the protesters saying? A mood of celebration on the streets of Khartoum, which followed news of Mr Bashir’s arrest, evaporated when organisers called for a mass sit-in outside military headquarters to continue. An SPA statement said that “those who destroyed the country and killed the people are seeking to steal every drop of blood and sweat that the Sudanese people poured in their revolution that shook the throne of tyranny”. The SPA has previously said that any transitional administration must not include anyone from the “tyrannical regime”. 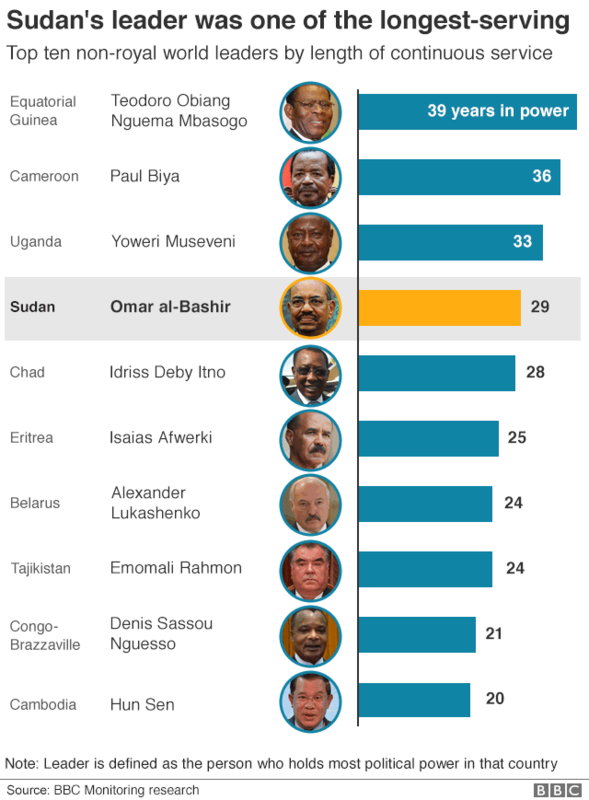 Crowds waved flags and chanted “Fall, again!” – refashioning their previous anti-Bashir slogan of “Fall, that’s all!”. The minister also said a three-month state of emergency was being put in place, with the constitution suspended. Who is the military council’s leader? Before the coup, Mr Ibn Ouf was Mr Bashir’s first vice-president and defence minister. He has also served as army commander and military intelligence chief. He is one of a group of officials subject to US sanctions from 2007 over support for the Janjaweed militia which was blamed for mass killings in the western Sudanese region of Darfur. It is not yet clear what will happen to former the 75-year-old, who is now in custody. He is the subject of an international arrest warrant issued by the International Criminal Court (ICC), which accuses him of organising war crimes and crimes against humanity in Darfur. His rule was marked by civil war. A conflict with the south of the country ended in 2005 and South Sudan became independent in 2011. Demonstrations against his rule began in December, triggered by a rise in the cost of living, and at least 38 people died in the unrest. The former army officer himself came to power in 1989 through a military coup. Russia, which twice hosted Mr Bashir despite the international travel ban he faced, called for calm and said it was monitoring the situation.